Manchester United and Arsenal played out a rip-roaring draw as Jose Mourinho’s men twice responded to freakish goals and secured a share of the spoils against Unai Emery’s side. Anthony Martial levelled shortly after David De Gea’s uncharacteristic mistake saw Shkodran Mustafi open the scoring in the first half at Old Trafford, where Jesse Lingard secured a 2-2 draw just 75 seconds after substitute Alexandre Lacazette squeezed Arsenal back into the lead. 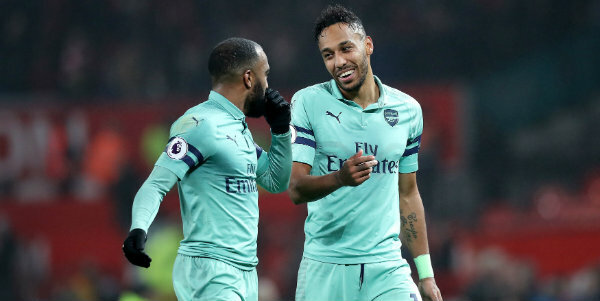 It was a frantic, and at times feisty, encounter at Old Trafford, which saw Emery’s Arsenal rack up a 20th unbeaten game in all competitions as another winless league match leaves United off the pace in the top-four hunt. The Gunners, buoyed by their north London derby win, threatened to leave Old Trafford with all three points and went ahead after a De Gea mistake that raised as many eyebrows as Mourinho’s decision to drop Paul Pogba and Romelu Lukaku to the bench. But United hit back in a way that the watching Tyson Fury would be proud of, with Lingard capitalising on defensive confusion to turn home and set up a grandstand finish – one that would have brought an Arsenal win were it not for some stunning De Gea saves. Mourinho’s Reds had started brightly on a dank evening in Manchester, where their early intent brought a Marcus Rashford attempt. Yet, like so many times this season, they faded. Arsenal figured out how to shackle the home side and looked sharp in possession, with their crosses and creativity seeing the hosts’ backline creek. United were looking increasingly uncomfortable, but few would have predicted De Gea being culpable for the opening goal in the 26th minute. Mustafi’s header from a corner proved too much to handle for the United goalkeeper, whose fumbled stop looped up and crossed the line before Ander Herrera could hack clear. It was a setback that United responded to with a leveller four minutes later. Marcos Rojo, making his first club appearance of the season, was an unlikely free-kick taker, but his effort forced Bernd Leno into a low save. Herrera was quickest to react, perhaps also offside, and cut back for Martial to turn home. It sparked a frantic final 15 minutes to the first half, with Aaron Ramsey seeing an effort deflect wide, Rob Holding leaving on a stretcher and Rojo’s blocked attempt followed by an over-zealous challenge on Matteo Guendouzi. Referee Andre Marriner ignored calls for a red card and dished out a booking – one of five yellow cards shown in quick succession. Ex-United man Henrikh Mkhitaryan came on at the break as both teams started the second half slowly, with the Old Trafford faithful getting on their feet when the returning Eric Bailly tackled and Rojo saw a fizzing effort tipped over. Handball appeals were waved away from the resulting set piece, with Chis Smalling doing well to block Sead Kolasinac’s cross at the other end as play opened up and Arsenal scored once more. The otherwise impressive Rojo gave possession away under pressure and Lacazette broke through the middle. He played wide to Mkhitaryan, whose return pass to the substitute would end with the ball bobbling in despite late challenges from two United defenders. But the lead lasted just 75 seconds as Lingard stole in after Rojo’s long ball concerned Arsenal, with the defence’s inability to get control punished. It was all set up for a grandstand finish and Mkhitaryan turned over, with De Gea denying Pierre-Emerick Aubameyang with a superb one-handed save having brilliantly blocked his close-range efforts earlier. Rashford saw an attempt denied but De Gea again came to the rescue, superbly preventing Lucas Torreira’s shot finding the top corner before Mkhitaryan netted from an offside position. Be the first to comment on "Man Utd hit back to deny Arsenal in rip-roaring draw"